This weekend you can find Xûr hanging out in the Tower’s Hangar. Scourge of the Past Raid (Raid Node is on EDZ) and Gofannon Forge (Artifacts Edge, Nessus) are also available (Annual Pass Required). View more activity details, news, and more below. Note: To completely unlock Gofannon Forge kill fallen enemies until quest drops. This is what I have read so far. I will correct this if this is incorrect or there is more to it. View the Lost Forges page for more details. 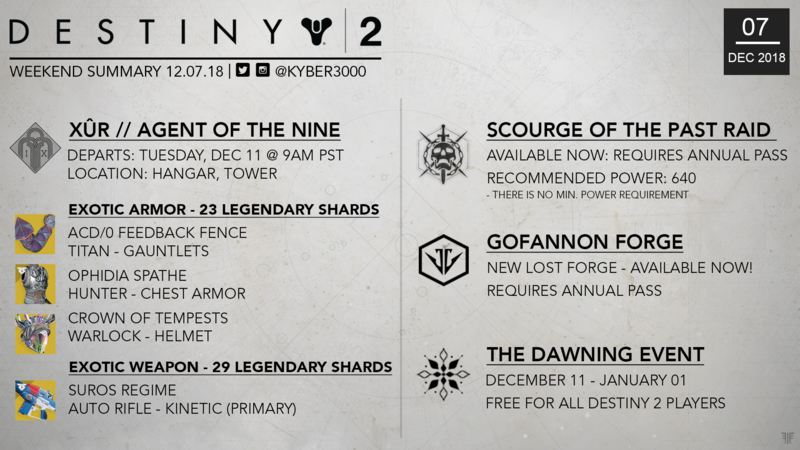 Visit this page for more details about Season of the Forge and Black Armory. Throughout each of the three seasons and the Forsaken Annual Pass that rolls out alongside them, Bungie intends to keep your Director filled with things to do each week. Some of those experiences will come and go (like the Dawning and Crimson Days), but others (like the Black Armory forges and raids) remain active after their initial introduction, building on the foundation of activities you can experience each week. For all players, the Dawning will light up on December 11. Learn more by visiting Bungie.net. BLACK ARMORY UPDATE – CHANGES TO POWER REQUIREMENTS! From Bungie Blog: Many of you are still increasing your power to attempt this new challenge. Yesterday, we lowered the Power requirement of the Lost Forge encounters by five. This wasn’t a huge change. These Forges are meant to be aspirational extensions of the endgame. But we did want to make them more accessible to Guardians around 600 Power. You can read the full details of the change and our goals here. For some of you the enemies guarding the Lost Forges are immune to your weapons. We promised more details for players who are still working their way up to 600 and beyond. Here is what we have planned to help you move more quickly up to 600. This change is planned to land in the 2.1.2 update on December 11. We are also considering additional changes to assist with the Power climb in a future update. We will continue to monitor your feedback on Season of the Forge as it continues. Info from Bungie blog post on Dec 06: The Scourge of the Past raid is now open to all of Guardians who have the Annual Pass and are brave enough to venture into the Last City to confront a new threat to its safety. Design Lead Brian Frank is here to brief you one last time before the race for World First begins tomorrow. Brian: The team could not be more excited for the Scourge of the Past Raid to unlock tomorrow and accept challengers to be the first to fight their way through the Last City and recover a forgotten secret of the Black Armory. As always, we will be cheering you on from the theater. Dust off your sparrow collections. You’re going to want the right perk, and the right look, for crossing the finish line. Make sure you grab the final chest to complete the activity before returning to orbit. Good luck Guardians! The first fireteam to defeat the raid will be crowned as World First and awarded with a raid belt. As always, they will be awarded to six teammates. Please note that, if you swap players out during the mission, the spoils will only go to the final six. Anyone who beats all of the encounters of Scourge of the Past in the first 24 hours will be awarded the “Scourge of Nothing” emblem. If you don’t think you can take down the final boss that fast, you will still have some extra time to qualify for the exclusive raid jacket through Bungie Rewards. You have until 9AM Pacific on 12/12 to beat the raid and claim your code to purchase the jacket on the Bungie Store. Here is a look at all of these rewards. As Brian mentioned above, if you think you have finished first, have someone in your fireteam grab the final chest and return to orbit immediately. Completing the activity is crossing the finish line. You can read the full rules here. Good luck! For more information concerning the Dawning, be sure to check the Dawning Guide on help.bungie.net. That’s not all you will earn while you celebrate the Dawning. As you gather ingredients and bake items, you will also progress towards unlocking this festive new Sparrow. Your new ride will come equipped with some very special perks. Glimmer Boost: While boosting, the Sparrow spawns a glimmer present every few seconds, until boost runs out. Glimmer presents burst open after a moment so that players can acquire the glimmer. Only active during the dawning. Glimmer Trick: When the player lands a trick with the Sparrow, 3 to 5 glimmer presents are spawned. Only active during the Dawning. Instant Summon: Reduces Sparrow summon time significantly. Dedicated bakers will also have triumphs to pursue. Those who unlock all the Triumphs during the Dawning will be flying in style. Double Drops: A new event means new wares from Eververse. During the Dawning, we’re continuing the tradition of double Engram drops. All players who are at max level (depending on what content they own) will receive both a Bright Engram and a Dawning Engram on every level-up. There will also be a “knock-out” list on the Dawning Engram, preventing you from receiving duplicate items until you’ve earned all of the new items. Also, get ready to throw down. One Exotic emote will be exclusive to a bundle, available for direct purchase with Silver. To find out more about the Annual Pass and content coming soon to Destiny 2 visit: https://www.destinythegame.com/annualpass. That wraps it up for now. I hope you all have a great weekend! Follow me on Twitter and Instagram for updates, news, and more!